What a day it was yesterday. I was up and ready to go to work on the river at 7 o’clock when I got a call to say that due to the high water levels it was too dangerous to work. So where to go fishing was my first thought. I had it in mind to take my lure rod and have a go at Sandsfoot over high water. As an afterthought I grabbed my beach gear and threw it in the car on the way out. As I came down the hill from Portland a wonderful sight greeted me. Chesil was rough and dirty, but not too rough to fish, blue sky and the wind had dropped to about a SW 12mph. Straight to the tackle shop to see what bait they had. I was lucky as they had just had a delivery of Peeler crab. I headed back to the Chesil Beach car park, where I met a chap called martin, that had been kind enough to provide me with some up to date information for the harbour during the summer. I invited him to join me as we set off on a fairly long walk along the shingle to one of my special marks. When we got to our spot it was evident that the conditions were near perfect for a very early season Cod, but would the fish be there, it is almost a month early after all. With all our gear set up we launched our baits as far as we could into the wind. As the waves were a bit on the large side it seemed that we were hardly casting any distance, but I think this was just an optical illusion as the amount of line left on the reel indicated we were probably hitting about 70 to 80yds, which in a heavily coloured deep shelving beach like Chesil was more than enough. 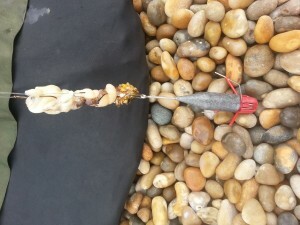 Bait and rigs for me was a 4/0 pennel rig baited with Squid and a whole Peeler crab. Martin did comment that compared to a Bristol Channel bait mine was quite small. The first half hour passed with not a lot of action as we got a feel for the wave and tide movement. A slight move uptide with the cast to allow the bait to end up in front of me paid off as the first of the Dogfish started feeding. This was a good indicator, letting me know that I was at least in an area that fish were feeding. Martin headed back to his car to put some more money in the meter. Just as he left I had a nice bite on my Century Tip Tornado that had sprinting to my rod to take up the slack line. I struck into a nice little weight. The pounding surf did its best to make it difficult to land the fish but I managed it and brought in my first Codling of the season. Nothing massive but at around 3lb it was a very welcome sight. As Martin popped back over the shingle he just looked at me as if to say I knew that would happen and we both laughed. A succession of bites followed most of which we seemed to miss for one reason or another. Part of the problem was I was sat quite far back from the water to keep safe and by the time I got to my rod from seeing the bite the slack line had either been buried under the shingle back wash or the fish had shook the hook. As I had only managed to get a few spare crabs I left Martin on the beach and dashed back into Weymouth to get some more crab and worm that I had ordered earlier. When I returned the weather had changed quite a bit and a steady rain was enough for Martin to decide to head home. Unfortunately for you Martin, your prediction that I would start catching as soon as you left was a good one. No sooner had he gone over the top of the shingle bank I got bites on both rods at the same time. This always proves to be a dilemma for me as to which rod to go for. I decided that I would go for the one that was out at the shortest range. Somehow I managed to get both fish on the beach, which delighted me no end. I wont go on an bore everyone with details of every fish I caught and I am not going to boast about numbers, what I will say is that the next two hours were a fish every cast, some were Dogfish and Pout and some were Codling. Everyone was like a replica of the last. They were all the same year class fish weighing around 3lb and I put most of them back. I hate seeing pictures of loads of fish all dead, lying on a beach. I only like to eat fish that is no more than 24 hours old so none go into my freezer. The good news is that the beach is still very coloured today, though the wind is out of the NE, which will give a bit of shelter and we have a nice size tide to keep the fish feeding for most of the tide cycle. You don’t have to fish over high water to catch, in fact I had more fish over low water than I did high. Wind: NE 23mph dropping to 17mph later this afternoon. Chesil Beach: Dirty and rough with a swell of 2m and some larger waves exceeding 3m. Portland: A large swell of almost 2m all around Portland with heavily coloured water. Portland Harbour: Small waves with slightly coloured water. Weymouth Bay: Small waves but the water is pretty coloured. 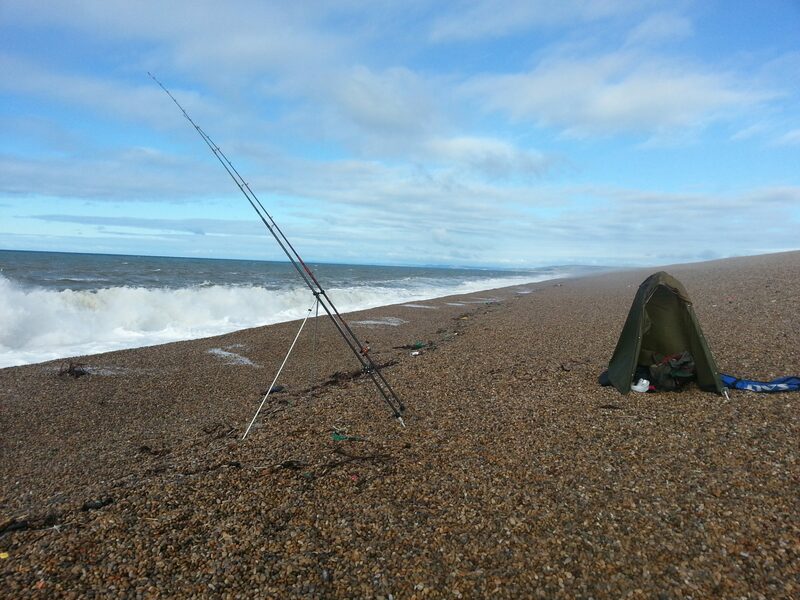 Chesil Beach forecast: Cod, Pout, Dogfish and Bass are about your only targets for today. 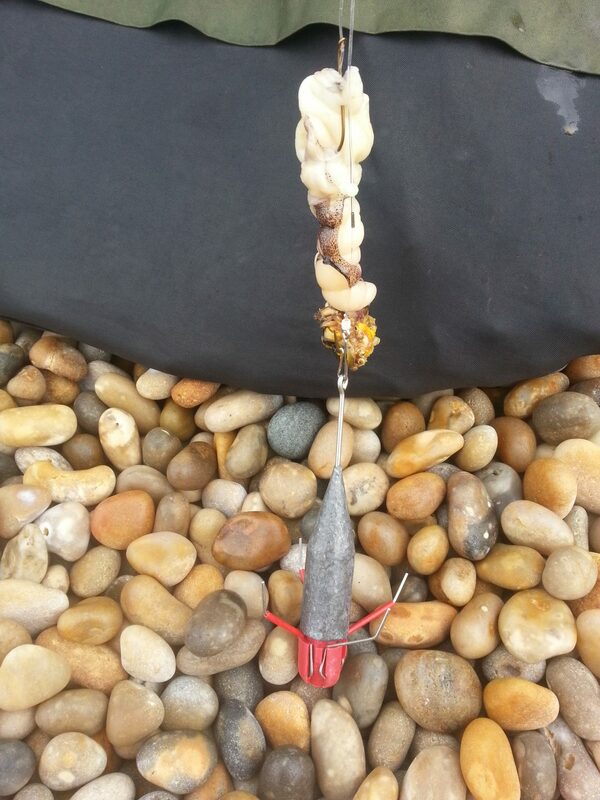 Use large baits, Peeler Crab, Hermit Crab, fresh black and blow lug and squid and mackerel will all produce. Portland: It will be a struggle to find a safe place to fish on Portland today. You should still be able to get some Pollock form the Bill and with the dirty water it will bring in the Bull Huss. Mackerel is the best bait to target Bull Huss, but you will need heavy gear. 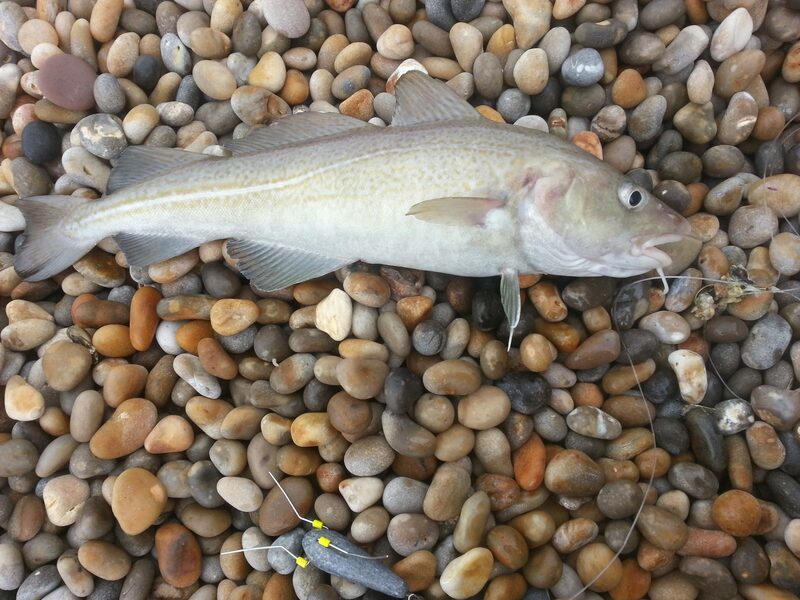 Portland Harbour: Flounder, Garfish, Scad and Bass are around in decent numbers. With a NE wind you might find a few Bass hunting around the Castle at Casletown. Boat & Kayak fishing: Not great for boat fishing today. I am pretty sure that most of the charter fleet will stay at home.